The literary career of Uchida Hyakken (1889–1971) encompassed a wide variety of styles and genres, including fiction, zuihitsu (essays), war diaries, poetry, travelogues, and children’s stories. In discussing his oeuvre, critics have circumscribed Hyakken to a private literary realm detached from the era in which he wrote. 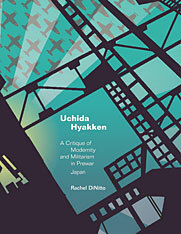 Rachel DiNitto provides a critical corrective by locating in Hyakken’s simple yet powerful literary language a new way to appreciate the various literary reactions to the modernization of the early decades of the twentieth century and a means to open up a literary space of protest, an alternate intellectual response to the era of militarism. This book takes up Hyakken’s fiction and essays written during Japan’s prewar years to investigate the intersection of his literature with the material and discursive surroundings of the time: a consumer-oriented print culture; the popular entertainment of film; the capitalist and cultural force of an emergent middle class; a planned, yet sprawling metropolis; and the war machine of an expanding Japanese empire. Emerging from this analysis is a writer who relied on the quotidian language of the everyday and the symbols of cultural modernism to counter the harsh realities of modernization and imperialism and to express sentiments contrary to the mainstream ideological rhetoric of the time.